Floodplains, river bottoms, and swamps. 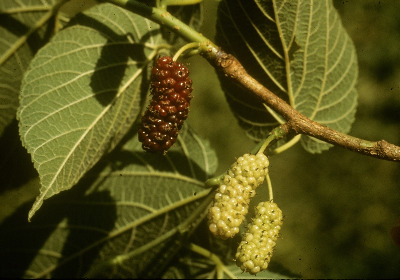 A scarce small tree, the very large, usually unlobed leaves are suggestive of a large leaved Tilia. The leaves are sometimes rather scabrous above. In Ontario, the small, isolated populations of M. rubra are threatened by hybridization with the common M. alba (Burgess & Husband, 2006). Ambiguous specimens that may be hybrids have been noted in Michigan, but more study is needed. MICHIGAN FLORA ONLINE. A. A. Reznicek, E. G. Voss, & B. S. Walters. February 2011. University of Michigan. Web. April 21, 2019. https://michiganflora.net/species.aspx?id=1703.